When using a floor jack, follow the instructions in the manual provided with the jack and perform the operation safely. When raising your vehicle with a floor jack, position the jack correctly. Improper placement may damage your vehicle or cause injury. 1 Take out the jack attachment. 2 Set the jack attachment on the floor jack and position the jack. 3 Before raising the vehicle, make sure that the floor jack is positioned so that the protrusion on the jack attachment fits securely into the hole of the jack point. Make sure to set the protrusion on the jack attachment properly into the hole of the jack point. 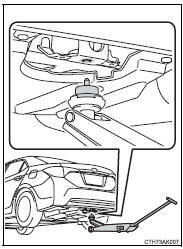 Raising the vehicle with an improperly positioned floor jack will damage the vehicle and may cause the vehicle to fall off the floor jack.